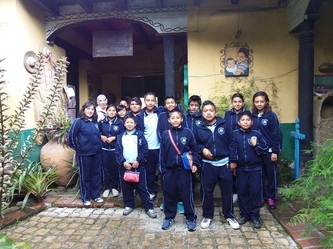 In the southern part of San Cristóbal, over several years, Don Sergio has built an elementary school room by room in barrio Cinco de Mayo, called Escuela Primaria Bilingue. This school serves approximately 300 children. Earlier this year, through IF, the organization Solar Together donated funding for a complete solar system to the school and it is up and running perfectly. However, the school did sustain cracks in a few of the rooms during the September 2017 earthquake. The solar system still functions and is undamaged. 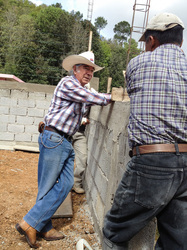 Don Sergio is in the process of making repairs to the school. Part of the school complex, you can see the blue solar panels on the middle building. dark and cloudy days, meals can be cooked without burning wood or paying for natural gas, and water can be pumped to the latrines. Don Sergio was asked by another poor barrio school to help with schoolyard repairs and playground improvements. Yok Chij is in the process of connecting a former Rotary Club donor with this project. 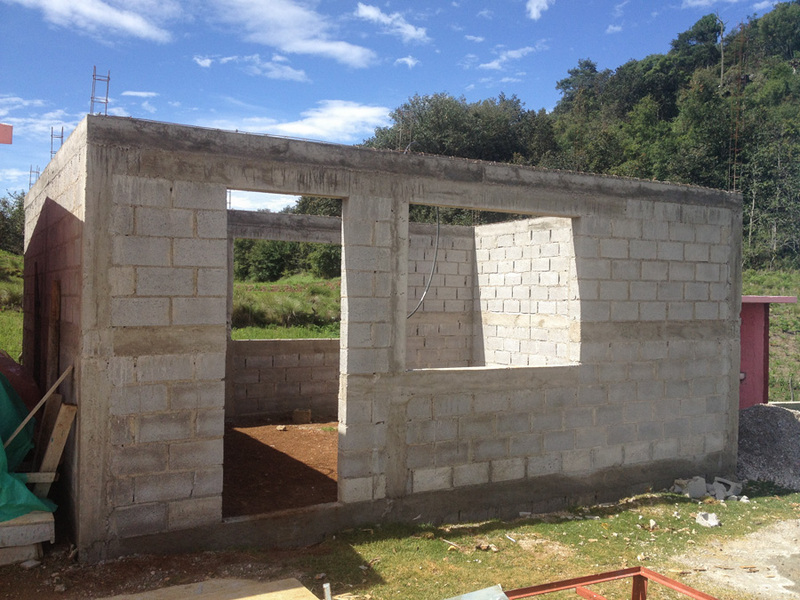 There is always a need for more financial assistance and donations to this project can be made through IF. 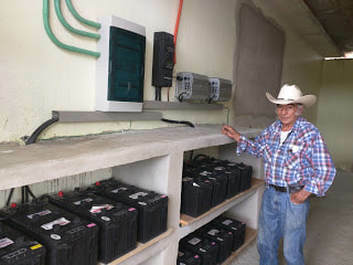 A special room was created to lock up the solar storage batteries. Photos courtesy of Patricia Ferrer. ​ In Summer 2017, Patricia Ferrer brought her pre-med nephew Ethan Hartman, physicians Vivian Shi and Ken Iserson, with another medical student Kheim Tran to work with Don Sergio. Dr. Iserson was invaluable in his providing primary care to many patients that come seeking Don Sergio’s help. The rest of our group provided wound care services. (updates from Patricia Ferrer on Sergio's blog). We had been aware of the recent protesting and violence in Oaxaca and although we did not see any protesting, we definitely experienced the effects. Teachers and health professionals (to my understanding have not been paid) create road blocks which prevent certain items to come in and out of the city. Tourism numbers are low and gasoline is limited. The lines at gas stations are long and they run out quickly. We cannot go out to the communities so we only treat the local patients....keeps us busy enough! As usual, he is grateful to all his friends that continue to support him and his work. The never-ending influx of patients with burns and wounds seems endless and all donations help reduce the suffering in this part of the world. At this time we have a 2 and a half-year-old that was pushed into a tub of hot water by her brother, which burned her back, legs and genitalia. These are first-degree burns (epidermal blisters) and superficial second-degree burns (the superficial portion of the dermis). These types of burns are so painful and although the little girl cries when we change her bandages, she lets us do our job. We do it as quickly and smoothly as possible. The poverty she, her family and neighbors live in astounds us:no clean water, no toilets, they cook with wood, the walls are thin planks, and discarded items are used in any way possible for shelter. There is no waste for the poor; they find utility in everything, just as nature does. "Its hard to believe I met Sergio 8 years ago and how little things have changed in his world of wound and burn care. At least as far as patients go: same accidents, different people. Our patients are the young, the old, and everyone in between. ​it when 'boom'. Both their hands and faces were burned. The boy's complete face (excluding his eyelids) has a superficial second degree burn and he looks like a kid from a horror movie. The back of his hands suffered a 1st degree burn in which the superficial aspect of his skin will peel and probably won't leave any scarring. At this point we really don't if he will be left with any facial disfigurement, but his function of blinking, and use of his mouth should be fine. Sergio cleans his face and applies cream and this 5 year-old does not cry. His absolute attention and caring in doing this must have some calming affect...plus the boy knows Sergio will give him a piece of chocolate afterwards. The uncle does the whimpering when we change the bandage on his right hand which has a superficial 2nd degree burn. His face suffered a burn equivalent to a chemical peel that many women in the US pay hundreds of dollars to help with wrinkles. His face is recovering very quickly but his hand will take longer. The older patients have diabetic or venous ulcers we see on a regular basis. The blindness from diabetes continues to amaze me and lack of education for diabetes prevention is sorely lacking (as it is in the US). It also continues to amaze me how people get along with their maladies that interfere with their daily activities of living and their quality of life. They seem to blame no one and accept their fate. Read more on Sergio's blog. 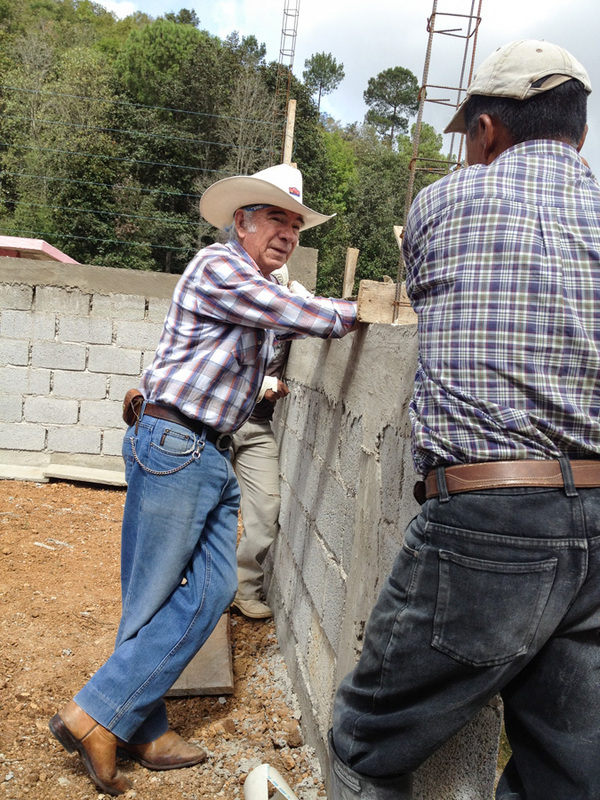 Don Sergio has built schools and many water treatment systems for areas in need in addition to his wound care. His most recent project is a 'despensario', kinda like a mini clinic. The government will fund a nurse to provide care for the locals in the area, once it is complete. Why the government does not build it, I'm not sure. But this is the same for the schools: Don Sergio builds schools in areas lacking and once the desks and chalkboards are in, then the government assigns a teacher. View the slideshow (right) on the school construction. 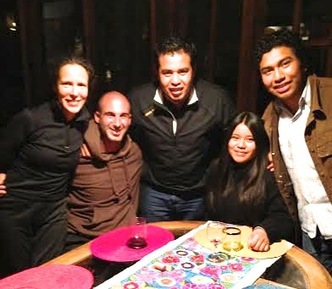 Adriana M Manago, an assistant professor of psychology at Western Washington University, who conducts research in the Maya community of Zinacantán, recounted her experience on a tour to San Juan Chamula with Sergio, Patricia Ferrer, and Nurse Practitioner Jennifer Eldred. I felt I was walking alongside a ray of hope in the world, a reminder that although good seems to disappear for some time, it will always return. ... it was the embrace in the main streets with an elderly woman that moved me to tears. This woman could not speak .., but her gestures, the look in her eyes, and the way she nestled so closely into Don Sergio’s arms told me everything I needed to know. Her hands up to the sky, then to her heart and mouth, and then melting into Don Sergio’s arms, she told me how Don Sergio saved her life with his medicine and that he was pure love. A love that heals you because it tells you that you are not alone in the world and that we are all here to care for each other." Patricia and Sergio's helpers, Iker, César, Edith & Alfonso. For over 45 years Sergio Castro (Yok Chij) has been working within the indigenous Mayan communities of San Cristóbal de las Casas in Chiapas, one of the poorest states of Mexico. Sergio spends most of his time providing medical and wound care to burn victims, and, with increasing frequency, patients suffering from the effects of type 2 diabetic complications. Don Sergio does not charge any fees. Ms. Ferrer provided IF with a report on Don Sergio's activities in 2014. During 2014, Don Sergio completed, on average, 140 patient visits a week. 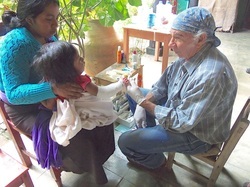 Many of the patients have wounds from burns and diabetic foot ulcers and venous stasis ulcers (leg). The reason for the frequent visits is that burns and wounds require daily to every 3 day wound care depending on the severity. The length of visit per patient also varies from 30 minutes of wound care for severely burned patients to 5 minutes for basic dressing change for healing leg ulcers. During parts of 2014 Don Sergio had the assistance of three pre-Medical students working with him and a Spanish RN Santo Iker (pictured in photos). Iker, from the Basque region of Spain, said when he arrived at his posada last year, he briefly met someone who told him of Don Sergio. Iker went on DS’s tour and then came back later to see if he could help. DS told him, “only look, don’t touch”. Iker, a well-trained RN with a lot of experience with serious wounds, saw DS getting busy so he stepped in and got to work. He has been in San Cris for almost a year and helps DS most evenings at the museo. Many people ask what will happen when Don Sergio is not able to provide wound and burn care to the people he’s been serving all these years. DS usually answers, ‘I don't know’ or ‘it will just stop’. It makes sense to train someone who can continue, but who would be likely to give of themselves as DS does? People have wanted to help but the follow-through has been iffy and in the past and has compromised his trust. Iker's working with DS consistently has built trust. Shortly after his arrival, César and Alfonso, two Coletos jovenes (young people born in San Cris) showed up wanting to learn and help DS as well. Now Edith (another premedical Coleta) is helping and its obvious DS appreciates and enjoys their help. They all plan on attending medical school and are eager to play a part in some type of patient care exposure. It is Patricia Ferrer's hope that these Coletos will continue to help and possibly return after all their medical training. Don Sergio treats a young patient.. Lack of diabetic education is a huge problem. Prevention is the key but for those who already have diabetes they need to know how to control it. Awareness of symptoms and proper healthcare follow-up are crucial. . ."
Burns and minor skin injuries is how Don Sergio first fell into the wound care business. Right now the burns are secondary to the diabetic ulcers." 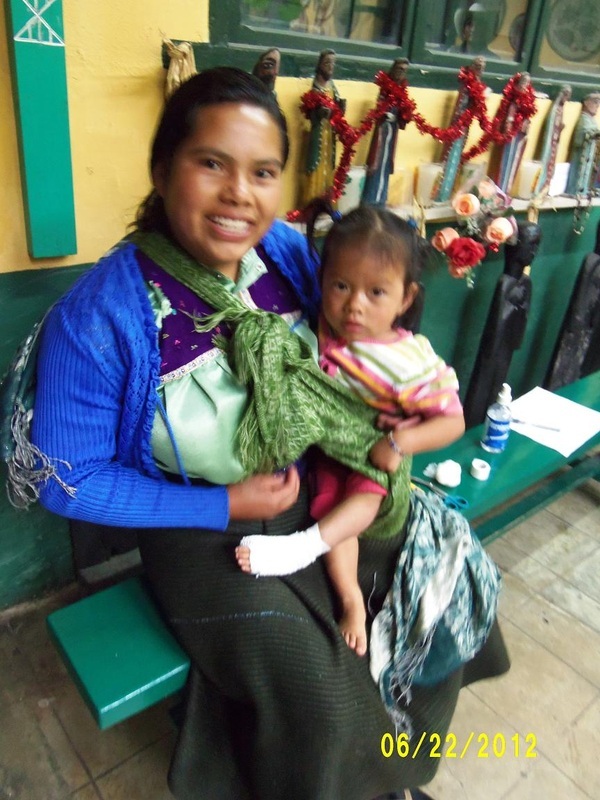 More on the spread diabetic complications in Chiapas. Sergio at new school in Cruz Quemada. IF received an annual update on Don Sergio's project activities in 2013. During 2013 Sergio Castro treated an average of 24 patients a week needing wound care. He works six days a week so he typically has 132 patient visits each week. In 2013 he treated approximately 1,248 patients. 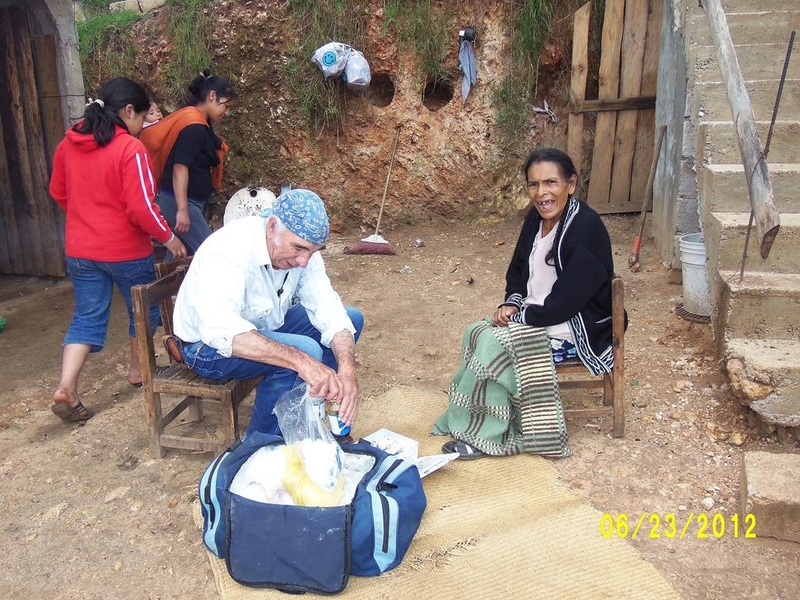 Some of the patients come to his clinic in San Cristobal for treatment in the evenings when Sr. Sergio has returned from his patients living in villages outside of town. The health care system in Chiapas (and Mexico in general) does not provide free wound care services. Today there is only one burn center in all of Mexico and it is located in Mexico City. As a result patients with serious burns or ulcers have nowhere to turn for help. 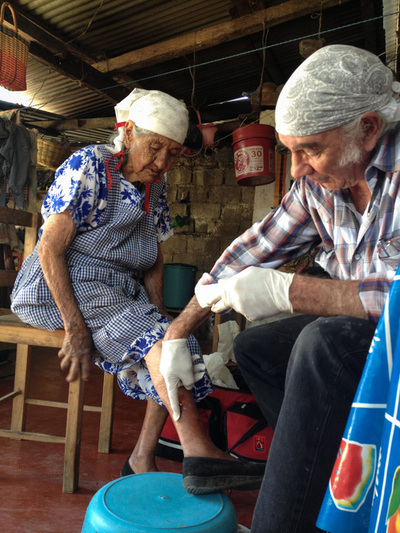 Sergio Castro has filled this void by caring for patients for free, often seeing them every day for a month or more to change their bandages and give them encouragement.In early 2013 Sr. Castro also completed a clean water system for storing water in the village of Cruz Quemada. And in the second half of 2013 he began work on a much larger water system which will service over 100 families in the community of Tzajal Chij. 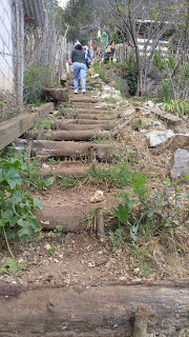 The first stage required work for improving the well, a large storage facility and pipes to distribute the water. 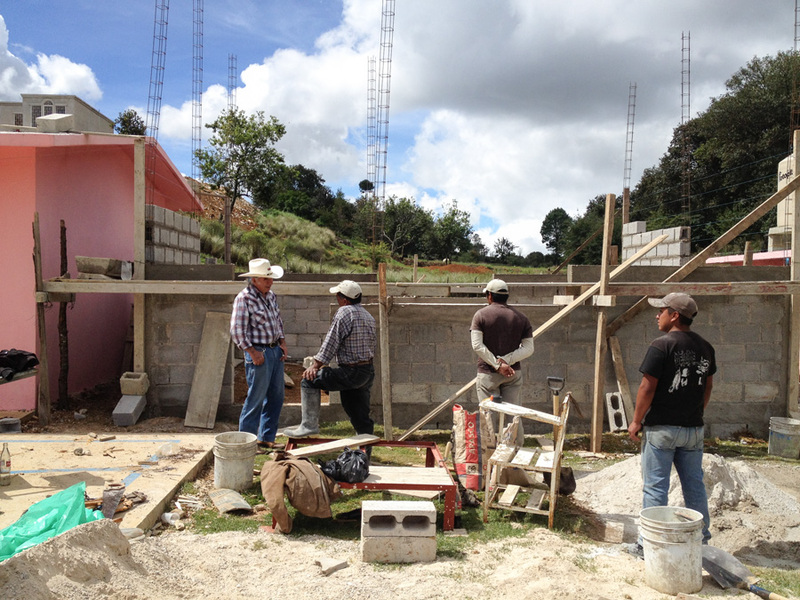 By early December the well improvements were completed. Additional tanks and a larger network of pipes are planned for 2014. 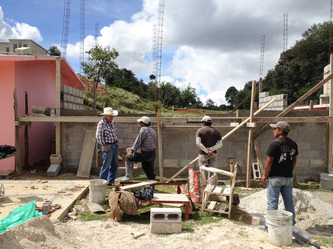 Sergio’s work with water systems is critical for improving the health of all the inhabitants in village and is especially important for very young children. Tzajal Chij has 175 families and given that the families are large, it is fair to estimate the number of people benefiting from the well improvement is over 1,000.Sergio also improved the entrance for the toilets at the local school in Cruz Quemada and helped to complete two classrooms that were partially completed but were not being used because they needed flooring and windows. In Mexico the government will provide a teacher for public school classes only when an adequate school room has been built by the community. 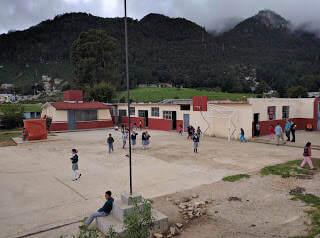 So the completion of the classrooms in Cruz Quemada (originally he worked on the 5th grade classroom but he decided to complete the kindergarten classroom as well) made it possible for approximately 60 children to attend school. Mary emphasized the importance of the funds that Sergio has received through IF for some of Sergio's clients who are most in need. 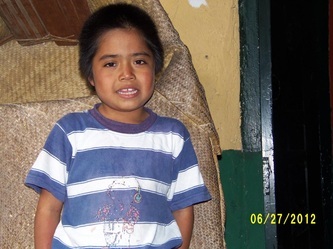 The funds provided through IF during 2013 were used to pay the costs of rent, utilities and maintenance of Sergio’s clinic and museum; medical supplies; and transportation costs to visit patients in the local villages who are unable to come to the clinic. 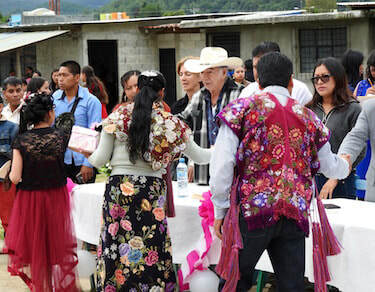 Sergio Castro has also built schools and water catchment and filtration systems for the indigenous villages and poor neighborhoods in the San Cristóbal area. Sergio wants to build new classrooms for a large elementary school near San Cristóbal. 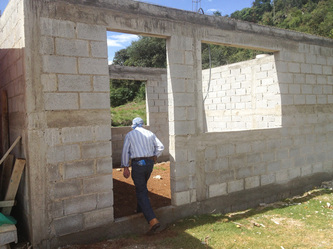 The classrooms that had been used in the past were poorly constructed out of adobe and the supports for the walls are inadequate. Because of the danger to the children, the school director has closed the rooms and they are meeting in a space that is not large enough for separate classes to be conducted very easily. A grant he has received from the Rotary Club in Whidbey Island, Washington, will assist him in this project. She emphasized the importance of the funds that Sergio has recently received through IF for some of Sergio's clients who are most in need. With the assistance of funds donated through IF Sergio is building a school room at Cruz Quemada, a village in San Juan Chamula municipio. He hopes to finish the school room before the start of the school year. That way the community can request a teacher from the education authorities for the 5th and 6th grade. They will only send a teacher when there is a classroom with windows, a door, lights, blackboards and furniture. They emphasized the importance of the funds that Sergio has recently received through IF for some of Sergio's clients who are most in need. 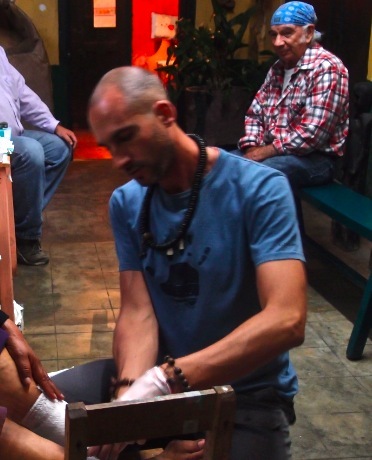 Until recently, medical supplies and other program materials were paid for by tourist donations at a museum of indigenous culture Don Sergio created in San Cristobal. Now that tourism in the area has slowed, the support of caring donors is greatly needed. They tell us that Sergio, now 73, was recently in an auto accident where he injured his mouth, ribs and back when his driver lost control and skidded off the road. He is still limping but the accident hardly slowed him down from providing medical assistance to those in need. His patients, who range range in age from 3 to 97, were grateful for the continuing care he provides. "I'm not sure if you heard about Sergio's auto accident that he amazingly seems to survive and carry on. 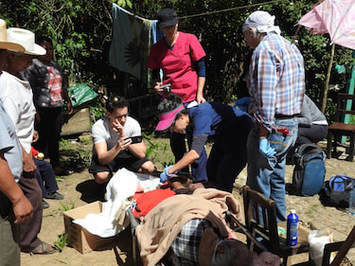 He injured his mouth, ribs and back but nothing can keep him from providing care to those in need. He just received 3 boxes of supplies from a group of individuals from Utah. Sean Graff, an RN from the VA in Utah has been in San Cris for the last year (with his wife and adolescent children) and works with don Sergio on Mondays. He has joined our forces to help Don Sergio in anyway possible. He has been a tremendous help to the don Sergio team and I'm sure gives don Sergio a break on Mondays. When Don Sergio first saw the 3 large boxes we delivered yesterday, he said 'esta un montón' of supplies (according to Google translate-- it's a heap, stack or slew). There is so much need in the world and getting the supplies and funding to someone like don Sergio is so worth the effort in all we are doing." They told the story of Petrona, who is unable to walk. 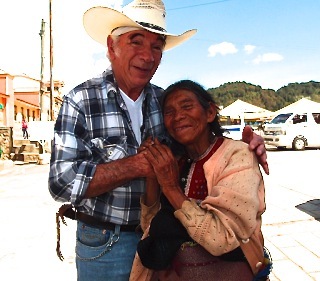 Don Sergio has known her for at least 10 years after building a school in her Chamulan community. When younger and without money or a wheelchair, she used to try to crawl to San Cristobal. 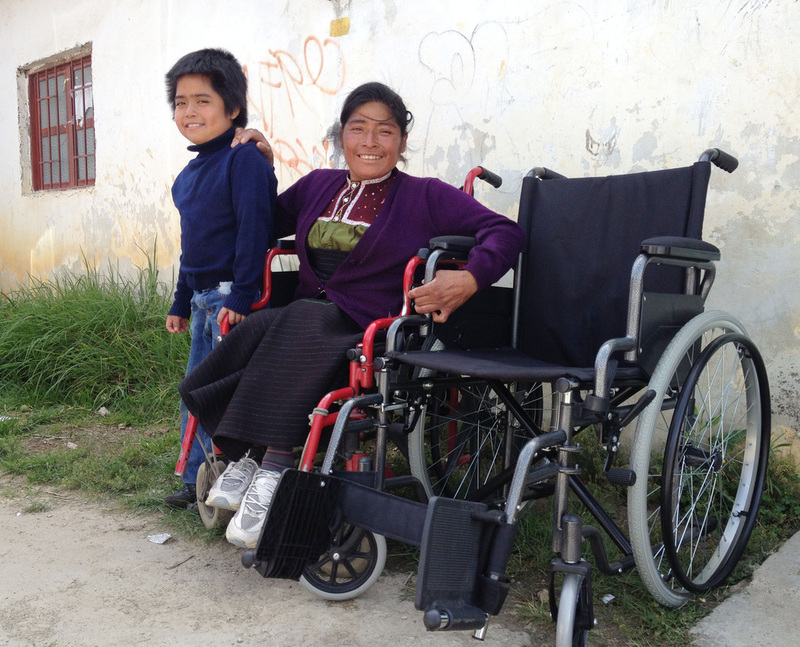 Since learning this, Sergio started paying for her transportation to San Cristobal via collectivo and he has recently was able to purchase a new wheelchair for her. For some time now, Sergio has also paid for Petrona's rent and some of her family's food needs since she is a single mother without family support and no clear means to earn money. Other patients include a young male patient who has recently become a quadriplegic (in an auto accident), who is being cared for by his young wife. Don Sergio is treating a large pressure ulcer that the patient received in the hospital before discharge. Sergio paid for 1 month of physical therapy to help ease this man's significant discomfort. Back to top. Considered a hero in Chiapas, Mexico, Sergio Castro has received numerous awards for his humanitarian and cultural work. 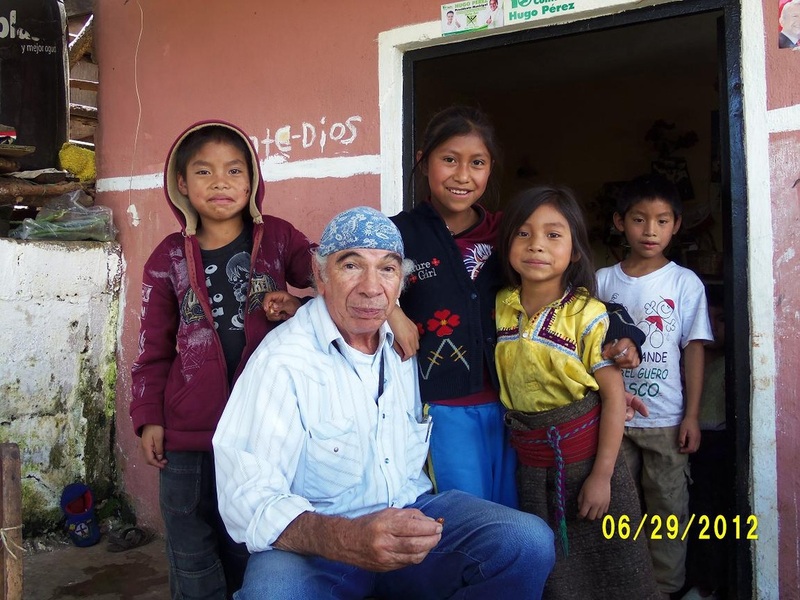 For over 45 years Sergio has been working within the indigenous Mayan communities of San Cristóbal de las Casas in Chiapas, one of the poorest states of Mexico. Before he began offering medical care, he devoted himself to agriculture, water infrastructure and schools. He also established a museum to educate foreign tourists on Mayan garb, costumes, art, artifacts, and language dialects. 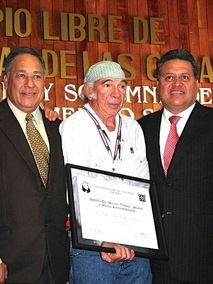 Sergio Castro receiving the Merito Sancristobalense Award in March 2009 in San Cristóbal de las Casas, Chiapas, Mexico. “Don Sergio arrived in the Tenejapa region of Chiapas in 1965 ... and quickly picked up the Tzeltal tongue. Working with the local people, he addressed two major needs - creating water treatment systems and building schools. As compensation for his work, the indigenous offered him their traditional clothing, wooden artifacts, musical instruments, and other traditional items. In the 1970's, Sergio had the idea of opening a museum to help him get some additional funding for the schools and for the medicine he needed . Today, this museum is also a walk-in medical clinic. On Sundays, he visits the very sick in their homes. We were in San Cristóbal in 2005 to meet Don Sergio and visit his museum. The museum displays more than 90 costumes and dress from the indigenous populations of Chiapas. Sergio presented a small group of us with a fascinating cultural history of Chiapas that described the geographical and religious background of the clothing on display. Patricia describes the daily challenges: “Don Sergio spends his days caring for wounds and burns, and also severe diabetic and lower leg ulcers. 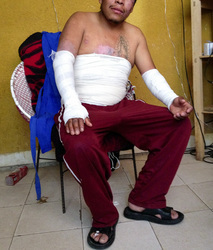 Diabetes is now rampant in Mexico...“Burns are common in el campo: wood fire is used for cooking and heat. Pots often break or explode. Don Sergio has learned to treat burns with the most rudimentary supplies. San Cristóbal attracts visitors from around the world. But the global recession and the often over-hyped dangers of the Mexican government’s “drug war” have taken their toll on tourism. The filmmakers, Consuelo Albaand John Speyer (http://veremosproductions.com), recently spoke to Sergio and he said he has more patients than ever. Donor support is more important than ever. Don Sergio’s official website is www.yokchij.org. You can learn here how you can visit the Museo. If you would like to make a tax-deductible donation please send your check to IF with a letter stating this donation is earmarked for Sergio Castro Martinez. Back to top.